The Home Office has now told people living in Stoke-on-Trent with pending asylum and immigration claims that they will no longer be able to report at their local police station, but will have to travel to Dallas Court in Salford, over 40 miles away. Navigating this six hour return journey is difficult for those who are fit and healthy, but is virtually impossible for those who have are single parents and must bring their children with them, or have mental or physical health issues. Local support and voluntary groups are already overstretched, and say this change will have an adverse impact on their budgets and resources. Most people who have applied for asylum or other immigration status and have not had a positive decision have to regularly report at their local Home Office reporting centre or a police station. A support group spoke of one woman who had had an horrific journey, it took her 8 – 10 hours from door to door, she got lost in Manchester, got off at the wrong stop, stood in a queue for 3 hours with her crutches. She was very distressed and very unwell for the next few days. Another man seeking asylum in Stoke, who had no severe mental health problems before he was compelled to report at Dallas Court, resorted to attempting suicide due to the distress it caused. The anxiety of reporting is always prevalent as the person will be aware that they may be detained but the stress due to the length and complexity of the journey to Salford added to the distress felt by this man and once he returned the prospect of returning meant he resorted to attempting suicide. He was subsequently admitted to an acute psychiatric ward and was not discharged for a month. The issue has received coverage in both the Independent and Sky News. “80,000 people in the UK have to regularly report at their local Home Office immigration centre. 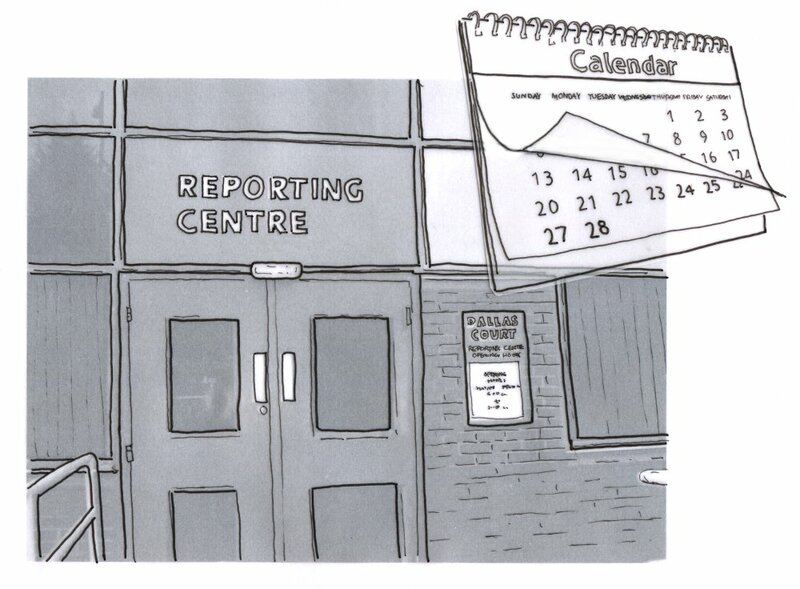 As well as the psychological burden that comes with reporting – [they] can be detained with each visit, and missing an appointment can go against your immigration case – travel is often an issue, even when a reporting centre is within the same city. Again, people who are further disadvantaged (childcare or health issues, destitute, etc) are particularly adversely affected. The Independent quoted Immigration minister Caroline Nokes as saying tha the move formed part of a wider programme to “rationalise reporting locations to more effectively manage the reporting population”, and that there was no upper limit to the distance a person may be required to travel in order to attend their nearest reporting location.